If you’ve been following the dispersal of the Space Shuttles to various museums around the U.S., you may have been struck by the variety of transportation methods used by NASA to relocate the retired fleet. Discovery traveled to its new home at the Steven F. Udvar-Hazy Center in Chantilly, Virginia, on the back of NASA 905 SCA. Explorer traveled to Houston by barge. Enterprise combined those two methods to arrive in New York. Later this year, Endeavour will piggy back on NASA’s jet to LAX, after which point it will travel by flatbed up the Santa Monica Freeway to the California Science Center. The journey, arrival, and unloading of the Shuttles have made for some riveting television for space enthusiasts. This weekend, when the crew cabin of the Space Shuttle Trainer (aka Full Fuselage Trainer, or FFT) arrived at Boeing Field for installation in Seattle’s Museum of Flight, we saw yet another method for moving equipment. It is safe to say that Seattlites are accustomed to seeing a lot of air traffic and they can be somewhat jaded when it comes to flying objects (listen to the complaints about the Blue Angels during Seafair if you don’t believe me). But it’s not often the Super Guppy buzzes the Space Needle, much less lands and parks in a museum parking lot. 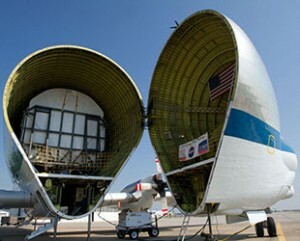 I’d say it was a once-in-a-lifetime experience, but the Super Guppy should touch down at Boeing Field twice more to deliver two sections of the payload bay. If you’d like to witness one of those landings, keep an eye on the Museum of Flight’s webpage for scheduled arrival dates. In the meantime, enjoy some sweet photos of yesterday’s landing courtesy of the Seattle Times.